Second incident in three months sees Turkish students arrested - this time under infamous sign at the entrance to notorious Nazi camp. Two Turkish tourists could face up to two years in prison for giving Nazi salutes outside the site of the Auschwitz-Birkenau extermination camp in Poland. The Turkish nationals - who according to Turkey's Zaman news site are a man and woman, both aged 22 - are apparently studying history at Budapest university in neighboring Hungary. 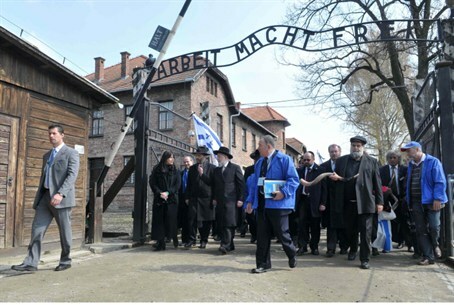 They reportedly took pictures of each other making the offensive gestures underneath the infamous "Arbeit macht frei" ("Work makes you free") sign, which stands at the entrance to the former death camp. The sign was one of the first - and for many, the last - things which the camp's estimated 1.1 million victims, approximately 90% of whom were Jewish, saw upon arrival, after being offloaded from crowded cattle carts. The pair will likely face charges for publicly promoting Nazi symbols in public, which is a criminal offense in Poland. This is not the first time Turkish students have been arrested for displays of fascism at the site of a former Polish concentration camp. In a similar incident in October, two Turkish university students were arrested at the site of the Majdanik death camp after giving Nazi salutes to a group of Israeli students and shouting "Heil Hitler". The two protested their innocence at the time, saying they had only meant the gestures "as a joke". This latest incident once more shines a spotlight on growing anti-Semitism in Turkey, a phenomenon which has forced many young Turkish Jews to leave the country and which many analysts blame on the ruling Islamist AKP party, whose own leading officials have actively engaged in anti-Semitic rhetoric. In July, Turkey's Deputy Prime Minister accused "Diaspora Jewry" of orchestrating the "Gezi Park" anti-government protests. Turkish Prime Minister Recep Tayyip Erdogan has a long history of anti-Semitic and racist remarks, including collectively comparing Jews to "Nazis" during his term as the mayor of Istanbul. And in May, a shocking documentary revealed alarming levels of anti-Semitism among Turkish immigrant youths in Holland, where growing anti-Semitism has been blamed largely on the country's growing Muslim population.